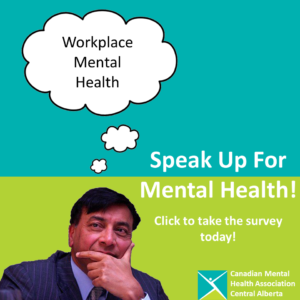 Central Alberta is growing and changing, so our mental health educational programs have to grow and change, too. It’s not just that there are more of us; we are also a more diverse community. We are finding that the days of “one size fits all” are over. mental health recovery and wellness. People answering the survey will also be able to weigh in on the importance of addiction education in these areas. 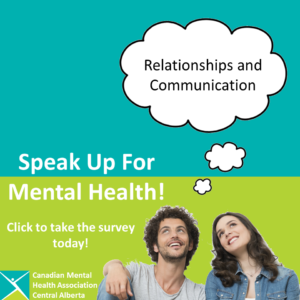 Between November 6 and December 28 people can go to www.speakupformentalhealth.com for information about the survey and click to take the survey on-line. 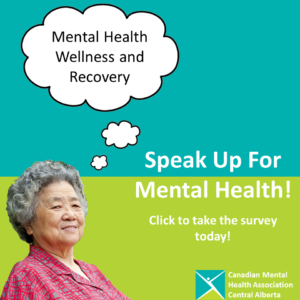 The survey can also be reached through the CMHA website, http://reddeer.cmha.ca or through social media, like the CMHA Red Deer Facebook and Twitter accounts. 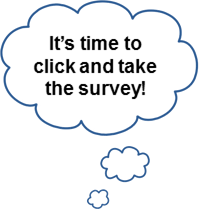 We are happy to mail surveys to people who do not wish to take the survey online. They can call us at 403-342-2266 and we’ll send one to them. They can drop it in the mail or take it to theCMHA office. We are located at 5017 50th Avenue, Red Deer, AB T4N 4B2. The survey is anonymous. The survey takes some people only 10 minutes or so to complete. Other people may take 30 minutes. Download these talking points and send them to your friends! Click to take the survey now! Hang one of our posters where you hang!